A ‘time-traveller’ claiming to be from the year 2030 claims that Donald Trump will be re-elected and artificial intelligence will take over. In a YouTube video posted by Apex TV, the man is strapped up to a lie detector and asked a series of questions. 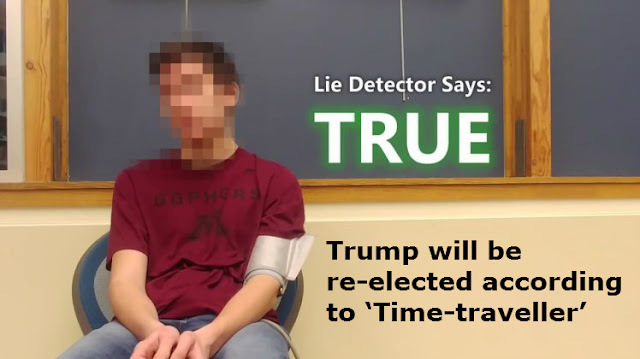 He is asked if he is really a time-traveller from 2030 and according to the lie detector, he is telling the truth. He claims that he has risked his life to travel back in time in order to fulfil his ‘mission’ and warn us what the world has in store over the next twelve years. The man also claims that robotics will have taken over the globe and technology will be able to independently run a home. In 2030, according to the prophet, the US president is someone called Ilana Remikee and global warming will have caused the temperature in North America to increase. Humans will reach Mars in 2028, electronic cars will have replaced diesel and petrol vehicles and many forms of cancer will have been cured. Although he fails to produce any, Noah claims he has ‘hard evidence’ to back up his predictions.